Laparoscopic adjustable gastric banding, a bariatric surgery, is preferred because of its minimal alteration of the gastrointestinal anatomy, reversibility and relatively low cost when compared to other bariatric surgeries. The major demerit is the high failure rate that often necessitates removal in up to 50% of patients. 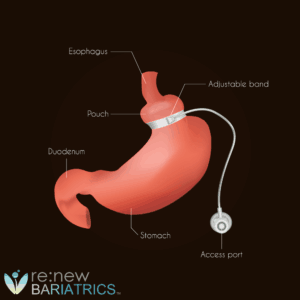 Gastric banding is a restrictive bariatric surgery where an adjustable silicone band is placed around the upper part of the stomach and then inflated with sterile water through the plastic tube that extends to an area just beneath the skin. The silicone band divides the stomach into small upper and large lower portions. The upper portion only accommodates a small amount of food while the lower portion serves as a passage for the partially digested food particles. The amount of water in the band can be increased or reduced to alter the tightness in the stomach. This is an advantage over other bariatric surgeries. The average percentage excess weight loss is around 49% (Cobourn, Chapman, Ali, & Amrhein, 2013), while a significant percentage of patients often achieve reversal/improvement in their comorbid conditions (hypertension, diabetes, osteoarthritis, dyslipidemia, sleep apnea, etc.). Also, the mortality rate is the lowest when compared to other weight loss surgeries. Averagely, 50% of excess weight loss is expected after Lap band. When patient lose less than half of this (<25%) or regain the already lost weight, the expected reversal and improvement in obesity-associated disease conditions may not be seen. For this group of patient, a revision surgery may be indicated. This is the most common indication for removal (DeMaria et al., 2001). The band may slip below the level of placement, or the lower portion of the stomach may slip above the band. This condition will create a large upper portion that will accommodate more food and thus prevent weight loss. Patients may vomit, experience difficulty with swallowing or even heartburn from reflux. The small upper pouch created after band placement may enlarge. This often occurs in patients who eat excessively or consumes carbonated drinks. The result of this is increasing in the intra-gastric pressure with subsequent dilatation (enlargement) of the stomach. In severe cases, the lower portion of the esophagus may also be enlarged resulting in heartburn as acidic food contents reflux into the dilated esophagus. This group of patients failed to lose weight as expected or re-gain the already lost weight. Another complication of Lap band that leads to removal is the erosion of the band into the wall of the stomach. It may further advance into the stomach lumen. This is often due to injury to the wall of the stomach during band placement or a band that is inflated with too much water making it too tight. Weight loss will be impaired, and the patient may have symptoms such as reduced satiety, epigastric pain, bleeding into the stomach (passage of dark shining stool or vomiting of blood). Even when the band is intact, one of the complications that may occur in patients with Lap band is the reflux of acidic stomach content from the gastric pouch into the lower portion of the esophagus. As this portion of the esophagus cannot withstand acid, there is irritation and inflammation of the wall of the esophagus resulting in heartburn, nausea, and vomiting. A breach of asepsis while placing the band may lead to the formation of an intra-abdominal abscess (pus). The band is a foreign body and will, therefore, harbor microorganisms making them inaccessible to antibiotics. Infection of the port site (where the band water can be adjusted) may also occur. This is evidenced by pain, redness, and swelling at the port site. Any of the above complications may be treated by band removal. The removal is often done via laparoscopic surgery. This usually takes less time compared with the placement surgery but may be prolonged if there are damages in the stomach to be repaired. The band, the tube and the port are all removed. The stomach is repaired if there is any damage. The cost of band removal is usually less compared to that of band placement. Insurance coverage for Lap band provides coverage for its removal in case of complications and also for the revision surgery that may follow. Following band removal, the original stomach size is restored, early satiety is lost, appetite is restored, and weight gain occurs. As the patient gain weight, the comorbid conditions which were probably improving may get worse. Recovery after Lap band removal is as in any other laparoscopic surgery. The immediate postoperative period may be characterized by pain at the incision site and feeling of abdominal discomfort from gaseous distension. Depression can be adequately managed with analgesics while the gaseous distension is usually transient. The removal of Lap band is not without its complications. These include bleeding, nausea, vomiting, gastric perforation, scaring around the stomach, and complications from anesthesia. An old band may be removed with the placement of a new one. This may be done if the removal was due to slippage or pouch dilatation with minimal or no injury to the stomach. The removal and re-banding are done at the same time. However, these patients are still prone to the complication that necessitated the removal of the first band and all other Lap band complications. For patients who had their band removed because of inadequate weight loss or band erosion, it is advisable to undergo another bariatric surgery that offers a superior weight loss. The gastric sleeve can be done after Lap band removal. The stomach is resected to reduce its capacity by 80%. This is similar to Lap band in its mode of action, i.e., limiting food intake but offers a superior weight loss potential. Complications are minimal. Gastric bypass surgery combines both restrictive and malabsorptive mechanisms to induce weight loss. The stomach is completely partitioned into a small upper pouch that serves as the definitive stomach while the large lower portion is bypassed. The small intestine is refashioned to reduce nutrient absorption. This surgery offers a better weight loss outcome and reversal of comorbid conditions. It also ameliorates heartburn from gastric reflux. Duodenal switch surgery is reserved for patients who are super obese and need to lose a significant amount of their excess weight. It consists of both gastric sleeve surgery as well as small intestinal reconstruction to significantly reduce nutrient absorption. It is costly, characterized by more complications as well as nutritional deficiencies. One of the reasons for the failure of Lap band is poor surgical technique while placing the band. Your choice of surgeon is, therefore, an essential ingredient towards having a successful Lap-band. Adherence to diet and exercise plan will prevent dilatation of your stomach and improve your weight loss. Avoid excessive eating, stay away from carbonated drinks and do regular exercise. In conclusion, high rate of failure is one of the significant demerits of laparoscopic adjustable gastric banding. While this can be treated by removal and re-banding; many patients will require revision to another bariatric surgery. Prevention is mainly by choosing the best of surgeons and strict adherence to diet and exercise plan.